As you might have realised here at Hooters Hall we’re keen to promote the use of native plants / wildflowers. Whether in wild areas in your garden/ on the smallholding or in a more formal design. Awareness of the importance of our native plants has been growing in recent years and in 2012 will get a big boost thanks to the Britain in Bloom campaign. The RHS (Royal Horticultural Society) is offering a free packet of annual wildflowers to groups involved in Britain in Bloom, It’s Your Neighbourhood , RHS affiliated societies and schools involved with the Campaign for school gardening. I’ve always associated Britain in Bloom with overly primped and tidy villages full of identikit bedding plants so it’s refreshing to see my sterotype challenged and hopefully the campaign will lead to more people appreciating and using native plants in their gardens. You need to apply by 12th March to get your free seeds. So far this autumn has been unseasonably mild a stark contrast to last years snow. Following on from a warm and dry Spring then a lacklustre Summer with an ongoing drought in some areas of the UK it seems the British climate is living up to its unpredictable reputation and keep us on our toes. The mildness of the season so far has made me concerned that this will be more of a challenge than expected. On the other hand I’m also concerned that those seedlings that have already germinated might suffer if the mild spell ends and is followed by a return to a more expected temperature range. Unseasonable weather and extremes of weather often prompt heated debates about climate change in the media. Whatever your opinion on the science and predictions for the future the effect that climate has on our native plants is interesting and something I found myself pondering this week. Whilst weather describes the day to day (at times minute to minute) variations of wind, rain, sun and temperature climate refers to variations and extremes of weather over time. The met office has lots of useful information about our climate as well as how and why it is changing. Native plants have adapted to our climate over many thousands of years and whilst it’s true to say that our climate has itself changed over those thousands of years it’s also true that the native flora of today is in many cases, although not all, very different to the native flora of times gone by. Considering the important part that native plants play in our ecosystem and the impact that changes in local flora can have on horticultural pests and disease it’s easy to see that such changes could have a big impact affecting not only the wild native flora and fauna but also agriculture. So if, as many scientists predict, there is a change in climate and Britain experiences an increase in temperature what will be the effect on our native plants. In 2007 research into the effect of climate change on the native flora of Ireland predicted that up to 20% of native Irish flora would be at risk in such a scenario. 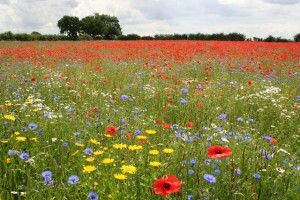 Native flora in Britain is also likely to be at risk. Plantlife has a undertaken a detailed assessment of the impact of climate change on British native plants. Overall the consensus is that as temperatures increase there is likely to be a progression of flora northwards and to higher altitudes. Obviously this will take time and it may be that there will simply not be enough time for our plants to adapt. Another complicating factor is the geographical distribution of our native plants. The impact of agriculture and spread of our towns and cities means that many native plants are really quite isolated and likely to find it difficult to make the move northwards. Their way being blocked by swathes of concrete and commercial farmland. No situation is ever all bad and a rise in temperature may have some benefits to horticulture and agriculture. A wider range of plants will be able to grow in our gardens with minimal cosseting and the range of commercial crops that can be grown in the UK may broaden thereby cutting down on food miles. But the cost is likely to be born by our native plants. Maybe one day in the future dedicated gardener’s will toil to cultivate rare and delicate native plants in their gardens just as some toil to create gardens full of exotics today. Why not be ahead of fashion and start gaining experience growing native plants in your garden now ? When I first got interested in growing native plants I popped down to my local garden centre to see if they had any seeds. There were a few meadow mixes but no single species seed. Online some of the bigger seed houses had a bit of a better selection but not extensive. However, there are places out there to get your nativc plant seeds and to save you the trouble of searching I’ve collected all the ones I’ve found here. Some also sell plug plants and between them I think you could probably source pretty much any garden worthy native that you may desire.